The time your family spends together is priceless. Being able to bond over a mutual love of sports is the dream. But with work, school and everything in between, you’re lucky to hit the gym together once a week. 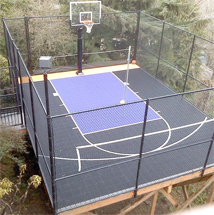 Bring home the game with a game court, no matter the size of your yard, or an indoor gym. Getting a healthy amount of exercise is only the start. Build a backyard where you can build a love for a sport and a deeper appreciation for your family. Keep an eye on our kids and meet their friends. Build a court for any game or a specialized basketball or volleyball court to give your athlete the perfect place to practice. 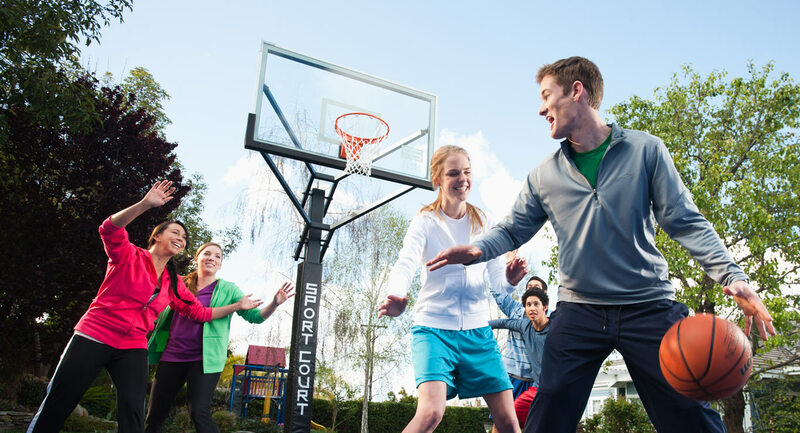 No matter the size of your family or home, we can build a court to fit into your budget. Share the sports you love with us and we’ll find the surface you need. A low-maintenance court will guarantee you can spend more time playing than landscaping. Enjoy every minute of childhood from the comfort of your yard. Your family deserves the best, there’s no denying that. We have a myriad of customizable features that will turn your backyard court or home gym into the perfect reflection of you. What Belongs on Your Home Court? Sports features: adjustable basketball hoops, variable-height net systems, volleyball and tennis nets, sports equipment packages, rebounders. Shine bright with: light poles with LED and incandescent bulb options. "It has been nearly five years since we got two Sport Court tennis courts…and the courts look as new as the day they were installed, and the tiles show no signs of wear." "Putting a gym in my house has made the winters much more fun for my family, every kid in the neighborhood is here." 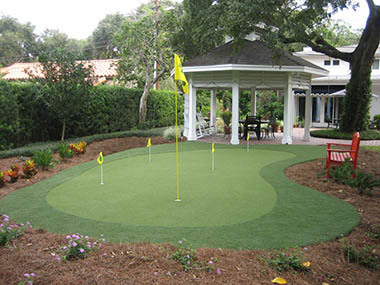 Synthetic lawns and putting greens. 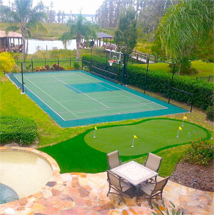 At Sport Court Carolina, we help you create a drought-tolerant lawn that can also improve your golf game. 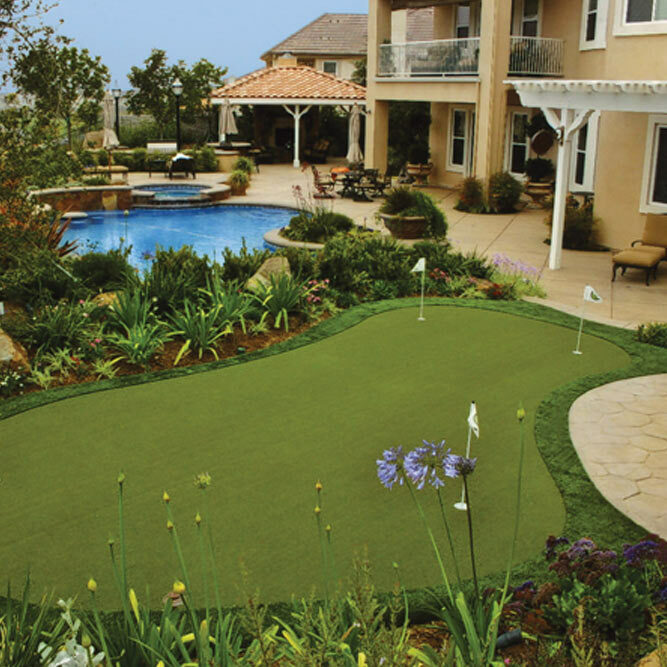 Our putting greens include natural breaks and slopes that can mimic those on your favorite course; and our synthetic lawns will give you a low-maintenance lawn that is the envy of your neighbors. 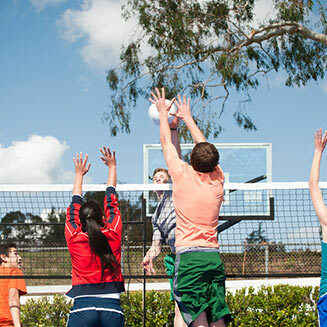 No family will make it all the way to an NCAA® volleyball court, USTA® tennis court, and FIBA® basketball court with injuries slowing them down. Our home court surfaces deliver the best combination of shock absorption, ball response, traction and playability that you can find outside of professional leagues. Want to know more about our safety? 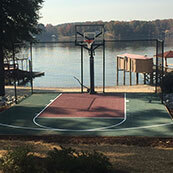 How much room do I need to fit a Sport Court game court in my yard? Sport Court game courts are custom-designed to fit not only the available space in your yard, but your family’s lifestyle, interests, and sports activities. So the answer is—we can build a court of almost any size or configuration, and our network of court builders is the world’s largest and most experienced, with over 100,000 projects completed. Why would you trust anyone else to build your family’s dream court? What is the time frame for installing a game court or home gym? 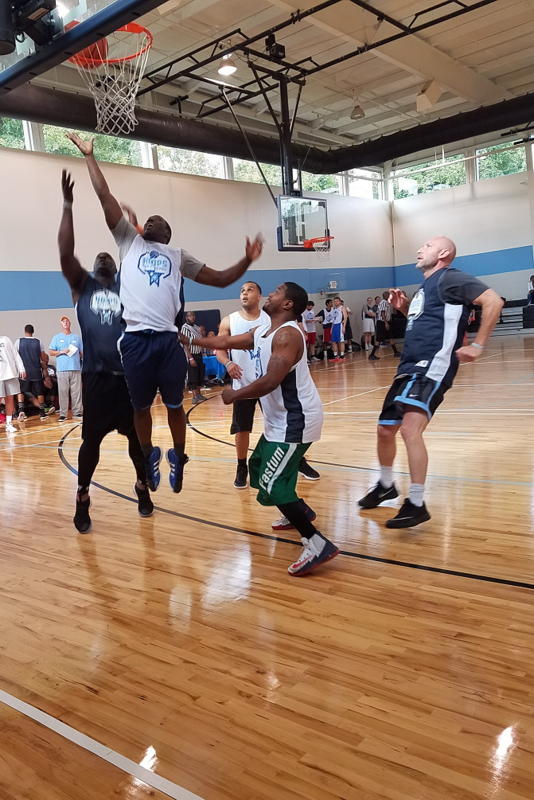 Depending on the size and scope of your court, your Sport Court representative can have you ‘ready to play’ in a matter of days. Of course, site preparation, concrete placement, and busy schedules—both for your court builder and your family—can require a little more time and planning. On average, count on about 4 – 6 weeks from the first time you meet with your Dealer until you’re shooting hoops or playing tennis with your kids. Are there court accessories available for purchase? 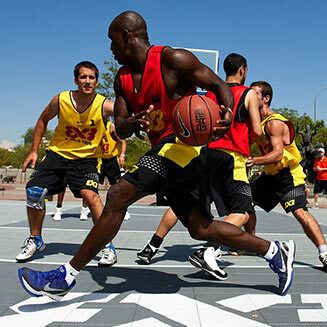 Sport Court game courts feature the widest variety and highest quality of components, accessories and equipment. 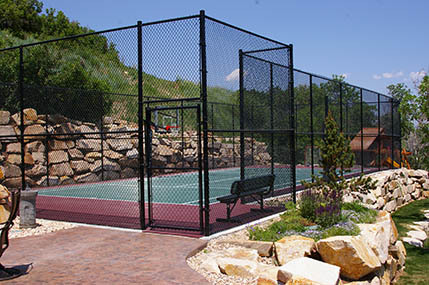 Depending on your family’s interests, these could include our SlamSystem hoops packages, with professional-style tempered glass backboards, lighting systems for night-time play, nets and racquets for tennis, badminton and other sports—virtually everything you would need for years of enjoyment and time together on your court. May I pick more than one color for my game court? We hope you will! 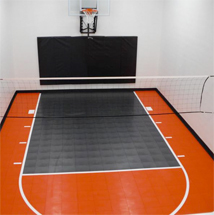 Sport Court game courts offer an almost unlimited number of color options and combinations. Whether it’s your school colors, or just a scheme that will fit your house, yard, or neighborhood, you set the design, and we build the court! Do you offer custom designs on game courts? Check out our photo gallery for ideas—we’ve done literally tens of thousands of courts, and you can either choose from one of the beautiful designs we’ve done, or sit down and create your own unique look with your Dealer. And for a truly professional finish, we can create special logos of your alma mater, favorite team, or family crest, right on the surface of your court. There will be no question whose court your friends and neighbors are playing on! If the sports surface becomes damaged, how difficult is it to replace? Nothing simpler! Since Sport Court game courts are constructed of durable polypropylene modules, the chance of any damage is slim, but in the event one or two modules need to be replaced, your court builder can quickly and easily fix the problem. What does it cost to build a Sport Court game court? We’ve built small ‘shooting courts’ for as little as $10,000 and multi-sport backyard complexes that might reach six figures. The point is that we can build what you want. Our local CourtBuilders can guide your design to include the features you want most within your budget, so you’ll get the court that is right for you and right for your budget. How do I maintain my Sport Court home gym flooring? Maintenance and care of your Sport Court game court is simple. A broom, blower, or hose can be used to keep the top surface free of debris, and since water drains quickly through the open grid, your court is ready for play soon after cleaning or inclement weather. We recommend that you have your Sport Court Dealer conduct an annual inspection and cleaning, check and greases components, replace nets and balls if necessary, and power-wash the sub-surface. How long has Sport Court been in business? 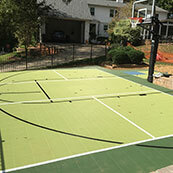 Sport Court has been building quality game courts and backyard recreational facilities since 1974. No other company has done it longer, or built more courts—we are the World’s Largest Courtbuilder—and that expertise and experience ensures that your court will be built with the skill and care it deserves. Why is the Sport Court surface important? Can’t I just play on painted concrete? Many of us grew up playing on a backyard concrete or asphalt slab—and some of us have the scars to prove it! The bottom line here is the safety of your children, and there is no outdoor sports surface that delivers a better combination of shock absorption (protection from injury), ball response, traction and playability than our PowerGame outdoor modular flooring. There are other choices available, but why would you trust the safety of your children to an inferior surface? How long will a game court last? Sport Court game courts are constructed of the highest-quality and most durable materials. Your Sport Court surfacing is covered by a 15-year limited warranty, and we expect it to deliver at least that many years of playability and fun for your family. In what ways are you better than other companies selling the same products? With almost any purchase you make, you have choices and alternatives, and there are a few other companies who build outdoor courts. Most of them claim to be ‘just as good as Sport Court’ and some will sell inferior products at lower prices. 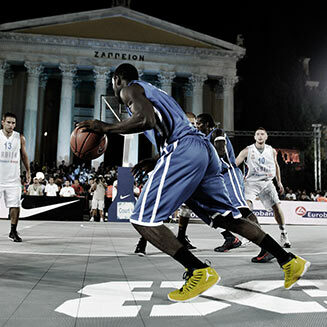 Sport Court is the original brand, with the world’s largest network of experienced courtbuilders. A game court is an important investment in your family’s health and togetherness—does it make sense to invest in something less than the best for your family? Is the surface slippery when wet? Almost any surface—whether grass, artificial turf, or even concrete or asphalt—can be slippery when wet. We don’t recommend active play on any wet surface, until the athlete has had the opportunity to test the surface and adjust his or her play accordingly. Fortunately, Sport Court’s open-grid design sheds water quickly, making it possible to return to action much sooner than with other surfaces, once the weather subsides. Do I need a permit to build a backyard court? In some communities, you may be required to get certain permits before building your backyard game court. Your Sport Court Dealer may have experience in working with your municipality or neighborhood, and can help you navigate the required regulations. There may be some restrictions on size, proximity to your property line, drainage, fencing, or lights, but you and your Dealer can work together to manage those requirements. Why do I need a visit from a local CourtBuilder? 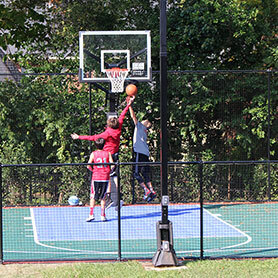 At Sport Court, every court we build is custom-designed and installed for you. There are many variables that we must identify when building your court, some projects require excavation or backfill, some communities require special permits and some places need a retaining wall to secure the court. On our local Court Builder’s initial site visit will show us what unique features your backyard may have and help us identify exactly what’s important to you and your family, so we can build the court that fits your needs.